Vanderbilt LifeFlight’s new base in Humboldt, Tennessee, will cover a 120-mile response area. 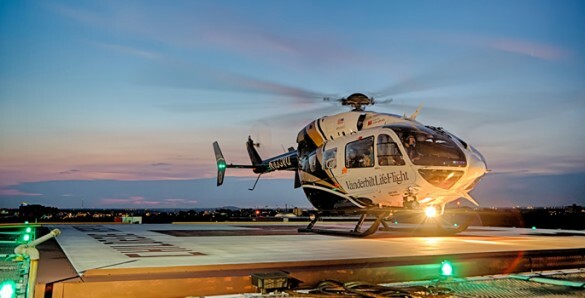 Vanderbilt LifeFlight will soon be expanding its footprint to serve the West Tennessee region by adding an emergency helicopter base in Humboldt, Tennessee. The new aircraft will be located in Gibson County at the Humboldt Municipal Airport. It will be the second Vanderbilt LifeFlight base in the area, with the other located in Henry County. The location was selected to strategically service hospital and EMS partners in the area. “We are excited to work with our partners at Air Methods Corporation to be able to add this new base to better serve our EMS (Emergency Medical Services) and hospital partners in West Tennessee,” said Stephan Russ, M.D., associate professor of Emergency Medicine at Vanderbilt University Medical Center (VUMC) and associate chief of staff for Vanderbilt University Adult Hospital. From Humboldt, the helicopter will cover a 120-mile response area and will transport patients who require advanced medical and surgical care from accident scenes. LifeFlight will also perform hospital-to-hospital transports in the region so that patients can be treated at tertiary care centers located across West Tennessee, including member hospitals and health systems in the Vanderbilt Health Affiliated Network. The new helicopter base at the Humboldt Municipal Airport represents an investment of more than $10 million in Gibson County. Construction will begin soon and the base is expected to open by the end of the year. The aircraft that will service the area is a twin engine Airbus Helicopter H-135 that can fly at speeds faster than 150 mph. Additionally, it is one of the few aircraft in the area that provides flight nurses 360-degree access to the patient, and the ability to fly under instrument flight rules (IFR). The aircraft is also equipped with air conditioning, state-of-the-art navigation, a communications and avionics package that includes night vision goggles, and a terrain avoidance warning system. Humboldt Mayor Marvin Sikes said the quality and caliber of care offered by Vanderbilt LifeFlight will have a dramatic impact on the area. Sikes added that the project offered economic benefits to the local community as well, and that the new facility at the Humboldt Municipal Airport would continue to boost redevelopment efforts, which the city has been working on over the last two years. Russ echoed his comments, and said Vanderbilt would provide a new tool for emergency responders.